Students learn how rooftop gardens help the environment and the lives of people, especially in urban areas. They gain an understanding of how plants reduce the urban heat island effect, improve air quality, provide agriculture space, reduce energy consumption and increase the aesthetic quality of cities. This draws upon the science of heat transfer (conduction, convection, radiation, materials, color) and ecology (plants, shade, carbon dioxide, photosynthesis), and the engineering requirements for rooftop gardens. In the associated activity, students apply their scientific knowledge to model and measure the effects of green roofs. The design of rooftop gardens incorporates the realms of environmental, structural, architectural and agricultural engineering. While green roofs or "living roofs" have a long human history, more recently they are being deliberately designed and implemented in urban areas to address the urban heat island effect as well as storm water runoff management, air and water pollution, and the creation of natural habitat. A range of scientific and mathematical concepts must be understood in the design of rooftop gardens, which require adequate structural capacity, irrigation and drainage provisions, air and water quality considerations, and ecology and agricultural expertise on wildlife, gardens and food crops. A basic understanding of ecology (the study of the relationships between organisms, including humans and the environment) is helpful. Describe the input and output components of photosynthesis. Describe what is meant by the ecosystem phenomenon called the "urban heat island effect." List and explain reasons why rooftop gardens are beneficial. Have you ever been to a city on a hot summer day? How does the temperature in the city compare to the temperature in nearby suburban or rural areas? Was it hotter or colder in the city? Why do you think it is hotter in the city? The phenomenon we are discussing is called the "urban heat island effect." The main cause of urban heat islands is how humans have changed the surface of the land through development. Locations that were once fields or woods or marshes have been changed into cities made with materials that retain heat more than a natural environment. What are examples of these materials? In a city with a lot of concrete buildings, the rooftops, which are often covered with black tar or gravel, sit in the direct sunlight all day and absorb heat. They radiate this heat back into the surrounding air, which can raise the temperature of the local environment by 5 to 7°F (3 to 4°C). The same thing happens with other surfaces such as paved roads, parking lots, and sidewalks. Another cause of the urban heat island is waste heat generated by energy usage in all those buildings. Have any of you ever stood near the side or back of a refrigerator (or air conditioner) and felt blowing hot air? This is an example of waste heat from the energy being used to keep the refrigerator cool. Can anyone think of other energy uses in a city? Let's explore one option that may help reduce the urban heat island effect: rooftop gardens. Engineers all over the world have designed rooftop gardens. Rooftop gardens have been built in Colorado, Oregon, in Chicago, New York, in Canada, Germany, Switzerland, Egypt, and in many, many other places on our planet. Compared to black tar or gravel on roofs, plants on a rooftop absorb less heat. Here's an example. One summer day in Chicago when the air temperature was in the 90s, measurements were taken of the temperature on the surface of a black tar roof and on a rooftop garden. The tar roof was 169°F (76°C) and the rooftop garden was at 119°F (48°C). Even though both surfaces were hot, a 50°F (28°C) difference existed between the two types of roof surfaces! On the left side, we see that plants take in carbon dioxide (CO 2 ), water (H 2 O) and energy. Where do plants get energy from? (The sun.) On the right side of the equation, we see that the plants produce sugar or glucose (C 6 H 12 O 6 ) and oxygen (O 2 ). In terms of air quality, the most important part of this equation is that plants take in carbon dioxide and produce oxygen. Carbon dioxide helps trap heat radiated from the Earth, which leads to global warming. Besides acting as a greenhouse gas sink, additional rooftop garden benefits are providing more space in urban areas for agriculture and increasing the beauty of the urban space. Around the globe, rooftop gardens are benefiting people and businesses. The green roof at the U.S. Postal Service's processing center in New York City saves them $30,000 annually in heating and cooling costs. A café at Trent University in Canada produces in their rooftop garden the food they serve in the rooftop garden. In many countries, including Switzerland and Germany, it is required to make part of every roof "green." The result is increased demand for research and material/product design — this is when engineers come into the picture! Rooftop gardens demonstrate aspects of ecology, the study of the relationships between organisms, including humans, and the environment. Rooftop gardens can benefit human life by reducing the urban heat island effect, reducing greenhouse gas, providing more space for agriculture, reducing storm water runoff, reducing energy consumption, and increasing the beauty of cities. The urban heat island effect is a phenomenon in which a metropolitan area is significantly warmer than its surrounding rural areas. This is caused by the concentration of black asphalt paved roads, parking lots and black tar-covered roofs, which absorb the sun's heat and warm the surrounding environment. This contributes to cities requiring more energy to be cooled on hot summer days. The urban heat island effect also increases smog and stresses the health of people with respiratory illnesses. During photosynthesis , plants take in carbon dioxide and release oxygen. This contributes to improved air quality and helps reduce the temperature because carbon dioxide molecules in the air absorb heat energy and add to the increased temperature. In addition, rooftop garden plants often replace the commonly-used black tar surface, which itself contributes to raising temperatures. Figure 1. Typical layers that compose rooftop gardens or "green roofs." To create rooftop gardens, structural engineers test the condition and structural capacity of existing roofs, or design from scratch to accommodate the anticipated loads and conditions. In the design and construction of rooftop gardens, engineers must account for specific constraints, including: roof strength, roof access, the cost of building a rooftop garden, plant irrigation, drainage of irrigation and storm water runoff. 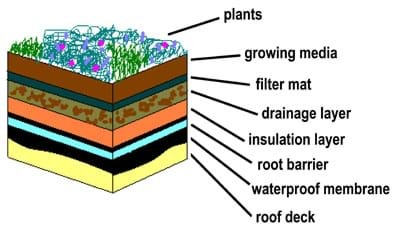 As shown in Figures 1 and 2, most rooftop gardens include many layers below the plants, such as growing media (soil), filter mat, drainage layer, insulation layer, root barrier, and waterproof membrane. Figure 2. On a sidewalk in Portland, OR, a demonstration plot shows the exact composition of the "green roof" on the building above it. Notice the membrane, soil and succulent plant layers. cycle: Any complete round or series of occurrences that repeats or is repeated. ecology: The study of the relationships between organisms, including humans, and the environment. engineer: A person who applies her/his understanding of science and math to creating things for the benefit of humanity and our world. photosynthesis: The synthesis of complex organic materials, especially carbohydrates, from carbon dioxide, water, and inorganic salts, using sunlight as the source of energy and with the aid of chlorophyll and associated pigments. plants: Any member of the kingdom Plantae, comprising multi-cellular organisms that typically produce their own food from inorganic matter by the process of photosynthesis and that have more or less rigid cell walls containing cellulose. sod: A section cut or torn from the surface of grassland, containing the matted roots of grass. temperature: A measure of the warmth or coldness of an object or substance with reference to some standard value. thermometer: An instrument for measuring temperature, often a sealed glass tube that contains a column of liquid, such as mercury, that expands and contracts, or rises and falls, with temperature changes, the temperature being read where the top of the column coincides with a calibrated scale marked on the tube or its frame. transpiration: The passage of water through a plant from the roots through the vascular system to the atmosphere. urban heat island effect: A phenomenon in which a metropolitan area is significantly warmer than its surrounding rural areas. Rooftop Gardens - Can rooftop gardens reduce the temperature inside and outside a building? Using foam core board, tar paper, sod, heat lamps and thermometers, students model, measure and graph the effects of green roofs on ambient and interior building temperatures. In the study of life science, you learn about ecology, which is the study of the relationships between organisms, including humans, and the environment. We learned about how rooftop gardens are an example of ecology in action. This is because the relationships between humans, the environment, and plants come together in rooftop gardens. The plants that make up green roofs help to decrease the urban heat island effect. What is this phenomenon? (Answer: When cities have higher temperatures than the surrounding rural areas.) Plants, and rooftop gardens, are able to reduce the temperature in cities through replacing materials such as tar, asphalt and concrete, creating shade, and through photosynthesis. Plants also improve air quality via photosynthesis; carbon dioxide is an input of the process and oxygen is an output. Engineers use their understanding of physical science, life science and ecology to design green roofs that benefit human life and the environment in cities. In addition, civil engineers use their knowledge of structures, materials and loads to determine the physical capacity of roofs, in order to correctly design suitable rooftop gardens for all sorts of buildings. With all this new information on rooftop gardens, has your opinion of possible uses of plants changed? Do you think constructing rooftop gardens is a good idea? Do you have any other ideas about how plants could be used to benefit our lives and/or the environment? How do engineers make sure that rooftop gardens actually benefit human life and the environment, based on these scientific principles? Pre/Post Quiz : Before beginning the lesson and its activity, have students complete the attached 10-question concept inventory Rooftop Gardens Quiz . Begin K-W-L Chart : Have students complete the first two columns of a K-W-L Chart , the "K" and the "W," which stand for what they already know, what they want to learn. How do you think urban heat islands affect the livelihood of people who live in a city? What are all the factors that must considered when constructing a rooftop garden? Describe all the heat transfer processes that must take place for the sun's energy to raise the temperature inside a building. Finish K-W-L Chart : Have students complete the K-W-L Chart by filling in the last column "L," with what they learned in the lesson and activity. Review their answers to gauge their subject matter comprehension. Pre/Post Quiz: At completion of the lesson and its associated activity and analysis, have students take the same Rooftop Gardens Quiz , comparing their results to their earlier scores to gauge their knowledge gains. Research : Have students conduct research to determine if any rooftop gardens exist in your town, city and/or state. Use the internet, personal observation, local library, and/or interviews with family and friends. Dictionary.com. Lexico Publishing Group, LLC. Accessed December 21, 2009. (Source of some vocabulary definitions, with some adaptation). http://www.dictionary.com. Green roof. Last modified November 18, 2010. Wikipedia, The Free Encyclopedia. Wikimedia Foundation, Inc. Accessed November 18, 2010. http://en.wikipedia.org/w/index.php?title=Green_roof&oldid=397498044. Green Roof Basics. City of Chicago. Accessed January 4, 2010. http://egov.cityofchicago.org/city/webportal/portalContentItemAction.do?contenTypeName=COC_EDITORIAL&contentOID=536912065&topChannelName=HomePage. Green Roof: Morgan Processing and Distribution Center, USPS Sustainability Fact Sheet. Last updated August 2010. U.S. Postal Service. about.usps.com/news/electronic-press-kits/greennews/greenkit-5.pdf Accessed January 16, 2011. Roof garden. Last modified June 24, 2010. Wikipeida, The Free Encyclopedia. Wikimedia Foundation, Inc. Accessed June 24, 2010. http://en.wikipedia.org/wiki/Rooftop_gardens. Roof Top Gardening. Published December 1999. City Farmer, Canada's Office of Urban Agriculture. Global Ecovillage Network Oceania & Asia Inc. http://genoa.ecovillage.org/genoceania/newsletter/archive/articles/pages/rooftop.html. Accessed December 20, 2009. Rooftop Gardens. USA Home and Garden. Accessed December 21, 2009. http://usahomeandgarden.com/garden/garden-rooftop/garden-rooftop.html. Rooftop Gardens from Around the World, Garden Plants and Gardening Forum. Updated December 7, 2007. The Grow Spot. Accessed January 4, 2010. http://www.thegrowspot.com/know/f5/rooftop-gardens-from-around-the-world-54020.html. Slutz, Sandra (Science Buddies). Rooftop Gardens: Are They a Cool Idea? Last edit date: May 12, 2008. Science Buddies. Accessed August 12, 2009. http://www.sciencebuddies.org/science-fair-projects/project_ideas/EnvEng_p026.shtml. Urban heat island. Last modified July 29, 2010. Wikipeida, The Free Encyclopedia. Wikimedia Foundation, Inc. Accessed June 24, 2010. http://en.wikipedia.org/wiki/Urban_heat_island. Oops! Something went wrong. Try to reload the page and to log in.